Nearly five years after a lethal terrorist attack on a U.S. consulate in Benghazi, Libya, killed an American ambassador and several others, overseas embassies are still not prepared to handle emergency evacuations, according to a new government oversight report, which disclosed that just four percent of American overseas posts had adequately performed mandatory emergency evacuation training from 2013 to 2016, a period when threats from terrorist groups and other forces grew. 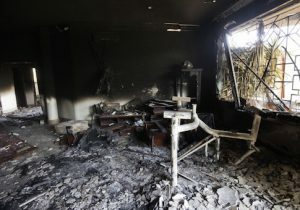 In the years since the fatal Benghazi attack, the State Department has been forced to evacuate American staff and their families from 23 overseas posts due to "various threats, such as terrorism, civil unrest, and natural disasters," according to the report, which urges the State Department to make these emergency drills a priority. Evacuation training is critical as U.S. overseas facilities continue to face mounting threats from terrorists and other types of militants, according to the report. While the State Department has clear guidance on the types of emergency training drills that need to be performed, U.S facilities have not been adequately implementing these strategies, which U.S. officials described as cumbersome and "not readily usable in emergency situations," according to investigators. "U.S. government personnel working at diplomatic and consular posts overseas—as well as family members present with them—continue to face threats to their security, including numerous attacks in high risk locations in recent years," according to the report, which was provided to the House Committee on Oversight and Government Reform. "According to the Department of State's (State) Bureau of Diplomatic Security (DS), there were 22 attacks against U.S. embassy facilities, consulates, or staff in 2013 alone, including an attack against U.S. Embassy Ankara in Turkey in which a suicide bomber detonated a concealed bomb in the embassy access pavilion," the report continues. "At Embassy Sana'a in Yemen and Embassy Tripoli in Libya, the threats were so severe and persistent that State decided to suspend operations, withdrawing all post staff and family members." Government investigators concluded the State Department has "gaps in its crisis and evacuation preparedness for overseas posts." Just around 50 percent of U.S. overseas posts had fully completed emergency training from 2013 to 2016. Nearly a quarter of all overseas posts "were late" in completing their emergency plans under a mandatory annual timeline, according to the report. Just two of 20 posts reviewed by the Government Accountability Office had actually updated key emergency plan materials. State Department personnel appear to view the emergency protocols, known as EAPs "as lengthy and cumbersome documents that are not readily usable in emergency situation," as is required by the department. While around 52 percent of U.S. overseas posts reported completing their annual drills, just 44 percent of these posts rated as "high or critical in political violence or terrorism" reported a full completion of emergency protocols, according to the report. On average, "78 percent of posts reported completing duck and cover drills, but only 36 percent of posts reported completing evacuation training drills," the report found. "Overall, less than 4 percent of posts reported completing all required drills during fiscal years 2013-2016." The failure to adequately train for an emergency situation, such as a terrorist attack, greatly increases the risk to U.S. personnel stationed abroad. "The gaps in State's implementation of preparedness processes for crises and evacuations at overseas posts increase the risk that post staff are not sufficiently prepared to handle crisis and emergency situations," the report states. In 2016 alone, around one in 12 overseas posts were "late in completing annual updates" by an average of six months or so. At least seven posts rated "high or critical" in political violence or terrorism were found to have been late in performing emergency reviews. There also are key flaws in the emergency plans themselves, according to State Department officials who spoke to federal investigators. These officials reported that the plans, which are supposed to be easily accessible in times of emergency, "are not readily usable in emergency situations."